Many businesses (from startups to more established companies) are choosing Montana to start, grow and/or expand their companies. Check out these six businesses that are new to the Montana job and business scene. And, welcome to Montana! Kudos is an “Instagram-for-kids type” app designed to safely introduce kids ages 8-13 to social media (including how to positively use social media). Co-founder and CEO, Ole Vidar Hestaas, came up with the idea for the app when his son, age seven at the time, asked his dad to create a platform like Instagram or Snapchat but “just for kids” after being told he was too young to sign up for the other social media websites that his older sisters were using. Learn more about the app, its story and some of its features here from TechCrunch. The startup, backed by $5.7 million in seed funding, was formerly based in Norway before more recently moving to Palo Alto, California. Recently, the company has opened a new customer support, moderation and artificial intelligence development office in Bozeman, Montana. According to the Bozeman Daily Chronicle, the company will house an eight-person moderation team to start, with the potential for a “couple hundred” additional employees over the next year. As founders with small kids ourselves, we are super excited to see these guys planting roots and growing this platform in our back yard. XY Planning Network, the leading turnkey financial planning platform for fee-only advisors serving Gen X and Gen Y clients, is moving from a 100% remote workforce to establishing a new company headquarters in Bozeman, Montana. What’s most exciting is that most the employees formerly working remotely across the country have decided to make the move to Bozeman, too. The fast-growing company has currently set up shop at the new CoWork Bozeman, a shared office / coworking space in the heart of downtown Bozeman, and will be looking to make several new hires by the end of the year (with many more planned for 2018). Check out the current Accountant / Bookkeeper position it’s currently hiring for on The Work Spot here. U.S. Optics, a manufacturing company that has been building custom rifle scopes and optics for 26 years, announced this fall that it’s moving its company headquarters to Kalispell, Montana, following an acquisition by veteran-owned Down Range Solution Groups. The company, previously headquartered in Southern California, will continue to manufacture and assemble optics for firearms and plans to bring many of the company’s long-time employees along for the move. Local Kalispell officials are optimistic about the positive economic impact to the area. Learn more about the relocation of its headquarters from Southern California to Kalispell here from the Daily Interlake. Fisher’s Technology is an office equipment and IT business based in Boise, Idaho. Following the acquisition of Billings-based Automated Office Systems, previously owned by Jack Lutgen for 35 years, the company announced it was expanding into Montana. Fisher’s Technology, founded in 1936, will maintain its headquarters in Idaho but will now operate a branch location in Billings and another in Great Falls. Fisher’s Technology, with five locations in Idaho (and now its two branches in Montana) was recently voted Idaho’s No 1. office equipment and information technology services company to work for by the Idaho Business Review’s readers and claims to be the largest Idaho-owned office technology provider. To learn more about the company and connect with its Montana locations, visit the website here. You can also visit its career page here, where you’ll find the company is currently hiring a Field Engineer and an Account Manager in Montana. Whether it’s planning meals for a week-long camping trip with a large group of friends, organizing meals for the youth camp or catering a full wedding, most can attest that planning and preparing meals for large groups is a daunting challenge. Introducing, the Wholesum Food Calculator - a new app, founded by Grace Brogan and John Kamman. The app is aimed at making large group meal planning and prepping easier and more fun by creating sharable meal plans / recipes, accommodating varying group dietary restrictions and estimating costs per group or recipe. Basically, it is making sure all stomachs are full and faces are happy. The app is currently available for a monthly or annual subscription fee. Want to learn more? 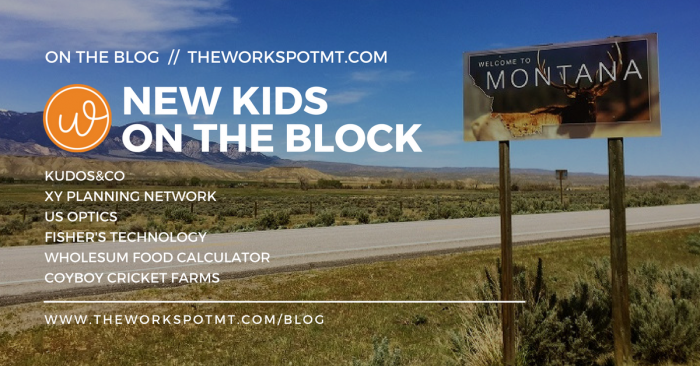 Check out the the Wholesum Food Calculator website or learn more about how they got started and where they’re going from the Missoulian here. Business is chirping at Montana’s first commercial cricket farm, Cowboy Cricket Farms. Located in Belgrade, Montana, the unsuspecting two-story warehouse is home to tens of thousands of crickets who are on their way to becoming a tasty source of protein by owners James and Kathy Rolin. The farm, which started operations in January of 2017, is an emerging industry leader in the entomophagy (edible insects) market in America. We hadn’t heard of “entomophagy” until now, either. Crickets are naturally high in protein, iron, and amino acids. They come in a small package and produce a much lower environmental impact as compared to other livestock. While many may shudder at the thought of crunching on an insect, many report the crickets are delicious. Roasted crickets along with cricket powder, chocolate chirp cookies and frass (cricket-based fertilizer), are the products currently produced in Belgrade. Officially under construction, the farm will soon also house a 2,000-square-foot, full commercial kitchen, allowing the farm to not only raise but also produce 50,000 pounds of crickets a year and allow for the business to hire a full-time kitchen manager. Interested in learning more or possibly tasting a roasted cricket? Tours of the farm are available and encouraged. Check out recent press earlier this summer from the Great Falls Tribune to learn more, or check out the company website.